This is not a tightly regimented event, so details are still in flux. The GOLDEN rule: All proceeds from everything go to Tyler Eklund, a friend and rad kid who was paralyzed while snowboarding. Paralyzed. Think about that when you reach for your wallet. 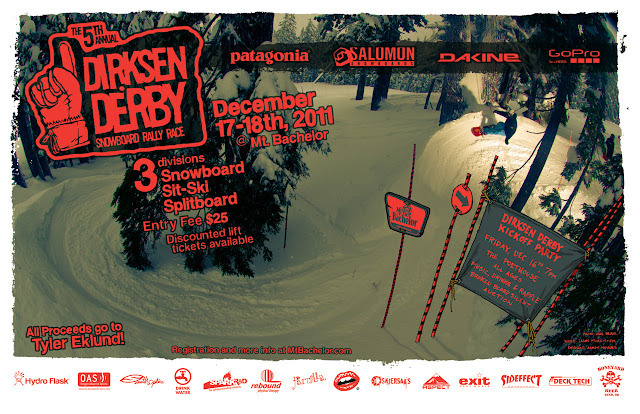 Dirksen Derby Kickoff Party: Friday, December 16th. Doors @ 7pm, Band at 8. Location: the Poet House in downtown Bend. All ages. Music, Drinks for 21+, Raffle, and “Broken Board” art auction. All proceeds go to Tyler. Racing: The whole weekend! Depending on weather, snow fall and poor planning, the schedule of the event will remain flexible. All participants are expected to be on-hill both Saturday and Sunday ready to either race the course, cheer on their fellow competitors, bash some windlips or stuff their faces with Parilla clam chowder. If everything goes perfectly as planned, Friday the course will be open for timed practice, Saturday we will hold both the Mens qualifier and the Splitboard race, and then Sunday will be everything else (the top Mens qualifiers from Saturday, Derby Elites, Womens, Older and Wiser, Groms and Sit-ski). But remember, the actual schedule can change quickly! Registration: $25 per racer, per event. All proceeds go to Tyler. Racers can register online at MtBachelor.com or at Mt. Bachelor`s West Village lodge on Friday afternoon, Saturday morning (8:00-10:00) or Sunday morning (8:00-10:00). There will NOT be a limit to the amount of competitors allowed in the event. Discounted lift tickets will be available at registration. Sponsors: Our exclusive list of sponsors include: Salomon snowboards, Patagonia, Dakine, GoPro, Mt. Bachelor, Hydro Flask, Oregon Adaptive Sports, Boneyard Beer, Smith Optics, Drink Water, Spark R&D, Rebound Physical Therapy, Parilla, Gummi Love, Skjersaa's, SideEffect, Aspect, Exit Real World, Mt. Hood 26, DeckTech, BAF, Mountain House, and Skull Candy.